The Glasgow University Uganda Expedition 2018 focused on geological research in the East African Rift System, specifically the Albertine Rift which is located on the western branch of the main EARS. We collected geological data which we will now process to give a better understanding of the geological processes related to the rift. 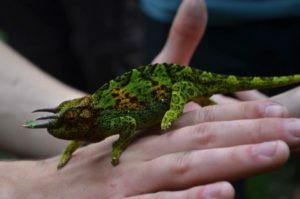 The expedition was 3 weeks longs, and as well as conducting research, the team seen many amazing sights – from colourful chameleons, spectacular mountains and equatorial glaciers, to mineralised veins in rocks, faults zones and active mining. Furthermore, the team had a chance to interact with locals, providing them with a unique insight into rural life in east Africa, specifically around the Rwenzori mountains.